There are so many motorcycles out there that you will often see something you have never seen before. Then there will be those that you had seen before, but may not see again for a while. The 1949 Panther Model 100 offered up is one of those that I have seen before, but few and far between. With it’s forward sloping engine, you will always remember it when you see it, but because of its relative rarity in the US, it seems to come into and out of my consciences really quickly. 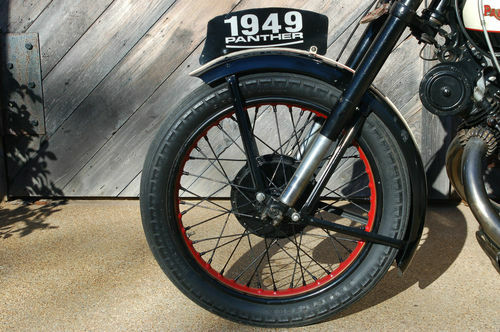 You are bidding on a very rare, collectible and almost completely original 1949 Panther M100. This is a one kick start bike and runs exceptionally. The compression is excellent and she idles brilliantly. Panther’s slogan was, “she fires at the poles”, and meaning that the engine turns so slow and torquey that she fires at the telephone poles. We have recently changed the oil and cleaned the wire mesh oil filter. Also, we adjusted the valves properly. The carburetor has been cleaned and we installed a carburetor kit. The carburetor was adjusted properly after the rebuild. The fuel lines have been replaced along with new in-line filters. The bike is completely original except that it’s missing the left passenger footrest and it has a 1953 BSA Smith Speedo from a different period. Also, the seat is a reproduction, as well as the 8” Lucas headlight. All the chrome is in excellent condition for a bike of its vintage and there’s no rust. The repaint is in phenomenal condition other than a wrinkle on the back of the front fender and some chipping on the triple clamp. All of the stripes are hand painted and flawless. The solo seat is brand new from England. This Panther comes equipped with an NOS brake/tail light. She still has the original exhaust and Lucas horn. The previous owner completely rebuilt the bike from one end to the other. She’s in top condition. A quick and fast great wide inter web search gives me the basics of the Panther 100. 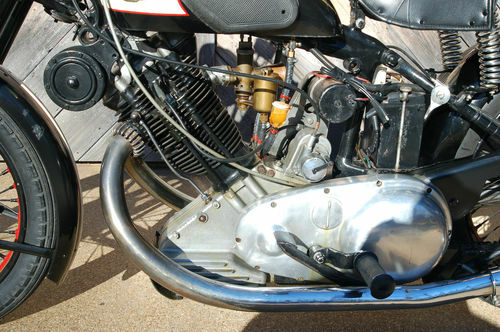 Build by Phelon & Moore from 1932 until 1963 the 598cc engine had a lowly 6.5:1 compression ratio and therefore generates only 23bhp at 5300 rpm. Like the seller says, low and slow. 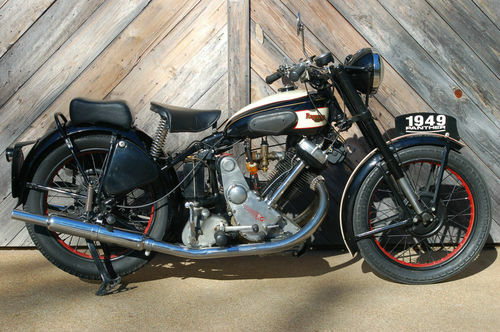 This 1949 model is going to have a few of the improvements from the original 1932 model, the major being the Dowty Oleomatic front forks replacing girder forks. 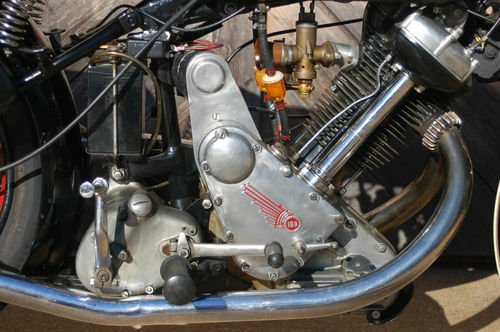 Other changes made up to the 1949 model year were cosmetic and visual changes to the tank, and rocker covers. 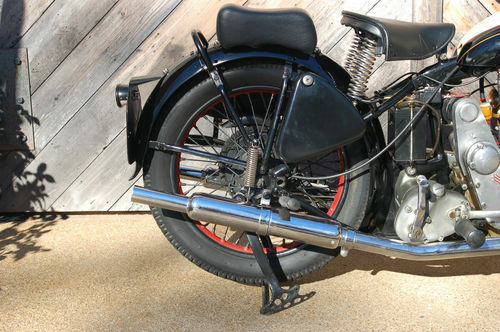 Changes after 1949 included a swing arm added in 1954 and other electrical changes.